Strengths: At the peak of his momentum, he may be the hardest character in the game to stop offensively. Has very difficult to block high-low, left-right mixups that are usually made safe through the use of skulls, and when he hits you, he can use curses to prevent you from earning the precious resources you need to stop his onslaught. His forward dash is replaced with a forward run, and he laughs maniacally during it, which will bring a smile to everyone in the room. Weaknesses: Spinal starts the match with no skulls, which means he is at his worst offensive power and has to play from behind at the start of every match. Even with skulls, he has relatively weak defense; no fast invincible reversal that doesn't lose to meaty crouching LK, a stubby teleport that can be easily option-selected against, and a very short range backdash that rarely avoids punishment. While he has a (fast) forward run, his normal walk speed, especially walking backwards, is terrible, which makes Spinal struggle in spacing wars. Spinal is at his best when loaded with skulls and pressuring on knockdown, and is at his worst when on his back. Notes: Spinal's Spectral Manuals combo trait not only gives him a skull with each use, but it also does a lot of potential damage for large cashouts in counter break situations. Spinal can fit two of them inside the lockout window for his 0 meter punish (and one of them for the combos involving meter) and they do more damage than trying to fit more heavy auto-doubles in the combo. Combos ending with shadow Skeleport will switch sides with the opponent. It would be nice to also apply instinct or shadow curses during these counter breaker combos, but unfortunately the damage lost is really significant, so it's hard to recommend. Spinal's skulls are a powerful resource that he can spend on a number of important actions. He earns skulls by using one of his several ghostly green attacks; crouching HP, forward throw, back throw, Searing Skull (with no skulls), and any spectral manual. The skulls will be seen floating above Spinal's head, and he can hold as most five skulls, though he starts the match with zero. Spinal can spend one skull by performing the Searing Skull special move, which will launch a purple projectile along the ground, at mid range, or straight up and down on top of the opponent's head using LP, MP, and HP respectively. On hit, this will curse the shadow meter of your opponent, preventing him from earning any more shadow meter while the curse is active. The shadow version of Searing Skull does not cost any skulls to use, but will instead launch a giant yellow projectile which will curse the instinct meter of your opponent, preventing any instinct from being earned. The color of the curse matches the color of the meter; purple skulls block the purple meter, and yellow skulls block the yellow meter. Because a character cannot use instinct unless their gauge is full, Spinal can prevent a character from earning instinct for a much longer period of time, although if the opponent has managed to earn a full bar, Spinal cannot prevent the activation. In order to remove curses, you must hit Spinal or, much less likely, wait 30 seconds. 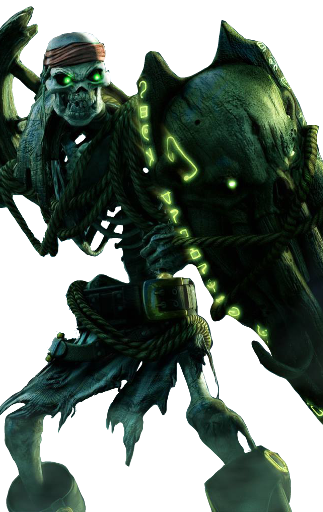 Spinal can stack curses on his opponent by using several regular or shadow Searing Skulls. Hitting Spinal one time will only remove the oldest curse, so you must hit him multiple times to remove multiple curses, whether that be several hits in neutral or in a combo. Apart from simply throwing skulls at his opponent to curse them, Spinal has a few more uses for his skulls. The heavy versions of each of his non-skull special moves consume a skull when used, and gains some additional properties. Heavy Boneshaker becomes projectile invincible and heavy Soul Sword swings twice and launches a little higher; both these moves automatically consume a skull when used. But most importantly, heavy Skeleport can be canceled into any other special move if you are willing to spend a skull. You may choose to cancel into another teleport, a safe on block Soul Sword, or any shadow move. Teleport canceling is one of the staples of Spinal's scary offense, especially if Searing Skull is used beforehand to launch a skull towards the opponent. The final use of skulls is the ability to run cancel any normal attack (except his crouching heavy attacks) at the cost of one skull, simply by tapping when the normal hits or is blocked. Spinal can create scary high-low mixups this way (by run canceling overheads or lows), and trying to block will let Spinal throw you and regenerate a skull. Especially when using standing HK as his run cancel normal, Spinal can force opponents into very difficult to defend positions in neutral, which helps Spinal start his offensive train. Spinal charges at his opponent shield first with Boneshaker, a safe on block pressure string. His main opener, however, is usually going to be Soul Sword, a giant vertical swing of his sword that is upper body invincible. The HP version of Soul Sword will launch the opponent (which lets you follow up with curses but not much else), so use the LP or MP versions if you want to keep the opponent grounded. Spinal also has a slide command normal using +HK, although it is terribly unsafe on block by itself. Fortunately, Spinal has two ways to make this move safe, which means this fast, long-range low attack can, and should, be used quite frequently. Firstly, it can be canceled into shadow Searing Skull which keeps Spinal only -2 on block, although because he is at very close range and does not have a strong invincible move, Spinal's offensive turn will most likely end if it's blocked. Secondly, it can be instinct canceled, which is a higher cost but will allow Spinal to apply a mixup on block instead. In both cases, the combo can be continued if the slide hits. One of Spinal's more common combo starters is using Searing Skull to launch a projectile at the opponent. Spinal not only gains a shadow meter or instinct curse, but will also be able to continue the combo by applying a manual. The light version of Searing Skull is the most unsafe on block, so it is best used for mixups on knockdown and avoided during block strings. Instead, stick to medium Searing Skull when your opponent is being pressured, which doesn't hit high or low but leaves Spinal at +3 advantage on block, perfect for following up with a normal attack and run canceling it for a surprise throw, teleport, or neutral jump mixup. Interestingly, Spinal gains Skeleport, normally a non-hitting attack, as a linker in the combo sequence. Spinal will always teleport behind the opponent and hit them with one, two, or three rising strikes depending on the strength used. Soul Sword is the go-to linker, as it does the most damage and the light version is fast in damage loops, but medium and heavy are easier to break since Spinal will animate two or three separate swings of his sword. Mix in Boneshaker and Skeleport to position Spinal closer to the corner or to switch sides as needed. Unlike most other characters in Killer Instinct, Spinal's shadow projectile (Searing Skull) does not launch the opponent off the ground, which means he is able to continue a grounded combo with a free manual. Most projectiles are unbreakable in KI, and shadow Searing Skull is no exception, but it does poor damage so its main goal is to apply an instinct curse, likely near the start of your combo so your opponent does not gain instinct meter while being hit by the rest of it. Both of Spinal's shadow linkers start very close to the end of the shadow freeze, but the first hit comes faster than average due to the short super freeze, so be prepared to catch the first hit earlier than you might expect. The pacing for Shadow Boneshaker is pretty close to "rapid fire" timing, so just break with a fast, steady rhythm to succeed here. Shadow Soul Sword by comparison is much slower, with decently large lockout gaps in between each hit. It has very similar timing to moves like Thunder's Triplax, Sadira's Blade Demon, Jago's Wind Kick, and Sabrewulf's Ragged Edge. Like each of those moves, however, choosing to break the last three hits is quite easy because you have time to hear the pattern from the first two hits and break in rhythm. Spinal has a wide assortment of useful enders. Your first combo is almost certainly going to end in Searing Skull, which grants Spinal at least one skull and up to four depending on the ender level, and lets Spinal access his scariest offensive options. After this, Spinal tends to prefer ending combos with his Soul Sword launcher ender, which can let him apply extra shadow or instinct curses on the airborne opponent if he chooses. Since Spinal relies heavily on the momentum gained by his skulls, he is more likely to do short combos with fewer chances to break, apply curses both during and after his combo, and start mixing the opponent up. Spinal's damage enders are way above average for damage dealt, which makes both the regular and shadow version a terrific way to end a combo if you aren't interested in spending skulls on curses, or you want to close out a match quickly. His momentum won't be as strong after the ender completes, but the damage is often worth this sacrifice. Spinal has neither a recapture nor a flipout move. His launcher ender, Soul Sword, lets him apply curses rather than go for airborne mixups, and Spinal has very strong grounded mixups on a knocked down opponent, so he gets by just fine without these extra mechanics. When Spinal first activates instinct, he immediately gains 3 skulls to his supply. Following this, all methods for earning skulls, not including Power Devour, will earn double the amount of skulls, which lets Spinal fuel up a bit more quickly as long as he lands throws or other ghostly attacks. But the main benefit of Spinal's instinct comes from firing projectiles using Searing Skull; each projectile fired will bounce off the wall or ceiling. A skull will disappear if it hits the opponent (and curses them), the opponent blocks it 3 times, or Spinal himself gets hit. Spinal can also use Power Devour to reabsorb the skulls into his supply if they have bounced off a wall and are traveling towards him, which lets him fire them again at a different angle or use the skulls for other means, like run cancels. The end result of this instinct is that Spinal is able to create chaos on the screen. By firing overhead vertical skulls that bounce between the floor and ceiling, and (potentially low-hitting) horizontal skulls that bounce between the stage boundaries, Spinal can force the opponent to wade through a veritable mess of bouncing projectiles while Spinal himself attacks with overheads, lows, or teleports from side to side. It can be a little difficult to get this mess of chaos going, especially since it all goes away if Spinal gets hit even a single time. But if you are able to fire even just a single skull and make your opponent respect it, for example after a knockdown or from over half the screen away, you will be able to get the engine started and the opponent will have to survive a series of mixups or take a risk to hit you in between the madness. Standing MP and HP are great midrange buttons which leads to a combo, even near max range, and are some of his better options while he doesn't have skulls available. During pressure, especially when you have skulls available to run cancel, standing HK is a fantastic long-range normal that can put the opponent in a lot of block stun and lead to mixups. Crouching MK makes Spinal stab at his opponent's feet with his shield; it's a decent low attack that is great in the run cancel mixup. The other half to that mixup will be Shield Crush ( +HP), a Jago-esque overhead which can start a combo even when run cancel is used. Spinal doesn't have a jumping crossup and he can't chain his crouching LKs, but he does have a dive kick by pressing MK in the air (no direction needed). It's good as a throw bait and ground bounces in combos, which can be used to curse your opponent in interesting ways after certain enders, but it's often quite unsafe unless it hits at the very tip, making it less useful as a footsies tool. His best air attack is probably jumping HP, a beefy air normal that Spinal can swing away with while he is on the approach or trying to intercept someone approaching him. As far as anti-air is concerned, use crouching HP. On hit, you'll gain a skull as a nice bonus. Spinal has a unique command normal called Power Devour, performed with +LP. Spinal holds his shield up and charges it with green magic for as long as you hold the LP button, and it absorbs all special moves. For each hit of the special move that Spinal absorbs, he earns a skull. It's punishable with normal attacks and throws, though, so you should only try it if you have a hard read that a special move is incoming (for example, in a reversal situation or on reaction to a slow shadow move). Power Devour is also great for shutting down certain multi-stage special moves, like Hisako's On Ryo Zan rekkas. You'll be seeing a lot of Searing Skull when you play against Spinal. The MP version sends a fireball at a normal trajectory and can be used to start combos via a manual, while the LP version hits low and the HP version hits overhead. It costs a skull to use, but Spinal gets tremendous mixups off these; as an example, perform a back throw (and earn a skull), then immediately throw HP skull and teleport either in front or behind your opponent for a free SFIV Seth-like mixup. If you have more skulls available, you can teleport behind your opponent with heavy Skeleport, and then switch sides yet again with another teleport, as many times as you have the skulls to spend, creating dirty crossups that are covered by the traveling Searing Skull. At any time, you can stop this mixup and throw, or perform run canceled normals. Spinal is a bit of an oddball. His movement is very non-standard, and he has a somewhat bizarre collection of normals and special moves that might not feel intuitive to use when you begin learning him. The first order of business is to weather the storm while you don't have skulls, then find a way to earn at least one skull via a throw, a crouching HP anti-air, ending a combo opening with Searing Skull ender, or maybe try to sneak a light Spectral Manual past them in a combo. When you have skulls, it's time to plan your offense. Run cancels are very good for Spinal, especially off his standing heavy buttons, and might be the primary way you spend skulls in the neutral game at first, because they lead to a fairly easy to implement "throw or not throw" mixup that can earn more skulls for Spinal. Both of his throws lead to scary mixups at the cost of one or two skulls, and any combo opening you have once you have skulls should end in Soul Sword launcher ender, so you can apply a shadow curse, an instinct curse, or both, and keep Spinal's momentum high. If you start a combo, try to use shadow Searing Skull near the start, so that the opponent will not earn instinct meter when you do a high-damage ender. Spinal tends to give zoners a pretty difficult time, since HK teleport travels behind the zoning wall, but be wary that it's quite punishable on its fast recovery, so it's not a free opening by any stretch. However, if you have a skull, you can cancel HK teleport into another teleport or a safe Soul Sword, shadow Searing Skull, or any other number of mixups, making Spinal pesky to pin down at times. Spinal lives and dies by his skulls and is perhaps the most momentum-dependent character in the game, but his instinct mode will ensure that he always will get access to a few of them at some point in every match, so take him into training mode or watch some scary Spinal players to make this strong character as terrifying as he can be. Just don't get knocked down. Spinal Frame Data: Includes run cancel data. Show me a robot with a laser.